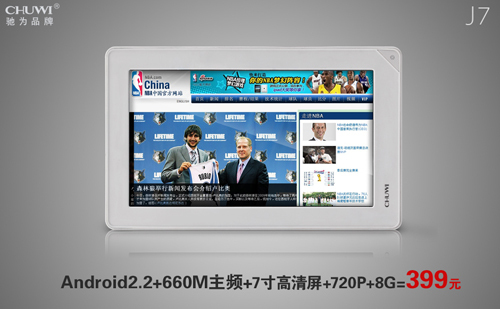 Chuwi has just introduced, the Chuwi J7 tablet PC running Android 2.2 OS and powered by a 660MHz processor. The Chuwi J7 is so far the cheapest Android 2.2 Tablet with 7 inch touch screen having 800×480 resolution and 8GB of internal storage. The Chuwi J7 tablet supports Flash content as well as HD video playback. Other features of the 7 inch Chuwi J7 tablet include Wi-Fi, mini USB, built-in speakers, microphone etc. Currently the Chuwi J7 tablet is available in 8GB version in China for a retail price of 399 Yuan or roughly $62 only which by far is the cheapest 7 inch Android 2.2 tablet released to date.